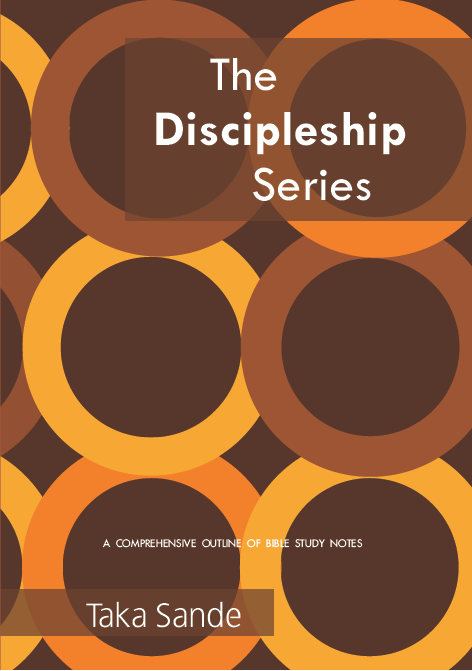 Christian faith in a nutshell, that’s what the summary of beliefs, creeds and core messages from the Bible is put together in The Discipleship Series. A comprehensive outline of personal devotional life, victory and challenges first. Then a dive into questions like who is God? Who’s the devil? What’s so special about the Bible? Who is Jesus Christ? Author Taka Sande takes his readers along the impact of the death and resurrection of Jesus Christ, our need to repent, get saved and put our faith in Jesus Christ. Next are the first steps as a Christians, seeds to see your spiritual life grown and have fruits: water baptism, the holy spirit, prayer, fasting, spiritual warfare, praise and worship, fellowship with other Christians, giving and charity, winning other souls for Christ and what to do when backsliding. It will urge you to live a life worthy of the calling you have received. Weak faith in the teacher cannot stir stronger faith in the student. Use this book as you study the Bible. God loves you regardless of what you can do or cannot do. Get ready to get stirred. Thanks to Sande to compile this guide for those interested in the Christian life. Taka Sande is an author, and a social and economic entrepreneur who facilitate social, spiritual and economic development. He has a passion for making a difference by influencing and adding value to people’s lives. He is the founder of the blog It’s My Footprint and a leader at Hatfield Christian Church in Pretoria, South africa. George W. Robertson – What is Evangelism?